Eastwind’s VNOC+ service provides you with both a Virtual Network Operations Center and an experienced technical staff to actually implement changes. Unlike other services that only point out alarms, we help SOLVE your problems. We provide you with the expertise you need when you need it to the degree you need it. Leveraging an experienced, US-based engineering team, we get to the heart of the matter quickly and, if desired by you, we can implement any changes. We stay with you until you’re satisfied service has been restored. In addition, our VNOC+ service also can enable you to proactively test and deploy new software releases and features preventing problems before they occur in your live network. Virtual Technician – With a team of certified US engineers, Eastwind can provide you with customized training, operations staff, and experienced depth for projects/testing. We work with you and provide you with a customized solution that meets your needs and budget. 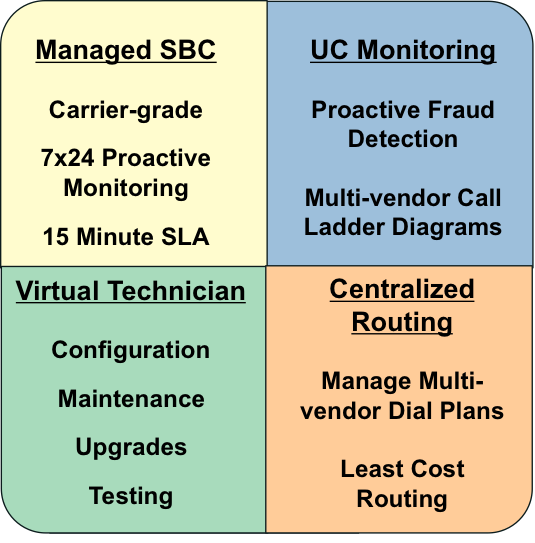 Session Border Controller Operations – Eastwind can provide 7x24 monitoring and maintenance of your SBCs. We work within your policies and procedures and provide you with proactive assistance in responding to issues as well as preventing issues from ever occurring by making changes to your network design as well as upgrading to the most appropriate software release. Hosted Dial Plan and LCR Management – By leveraging geographically diverse private clouds, Eastwind can also enable you to reliably and easily manage your dial plans for a fraction of the cost of owning your own. We are also not affiliated with any service provider. You can bring your own relationships and rates. We provide you with service provider flexibility and help you from getting locked into any one provider. Fraud Prevention and Monitoring – Eastwind provides you an on-premise solution to recognize fraud in real time while simultaneously providing you a platform to do multi-vendor call ladder diagrams and individual call leg recordings to maintain quality.